Just got caught up...nice progress! Good to see it sitting on the frame. You're on a better schedule than me, it's been over 10 years & I still haven't finish the current build. Now that I'm on my unscheduled vacation/holiday I have to put anything that cost on hold. 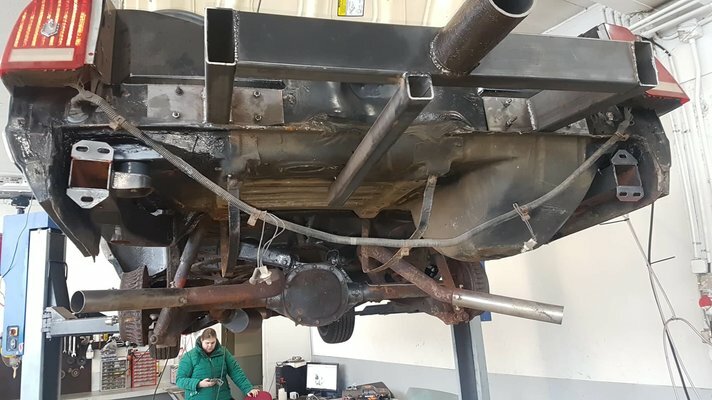 How does the rear of car attach to rotisserie? 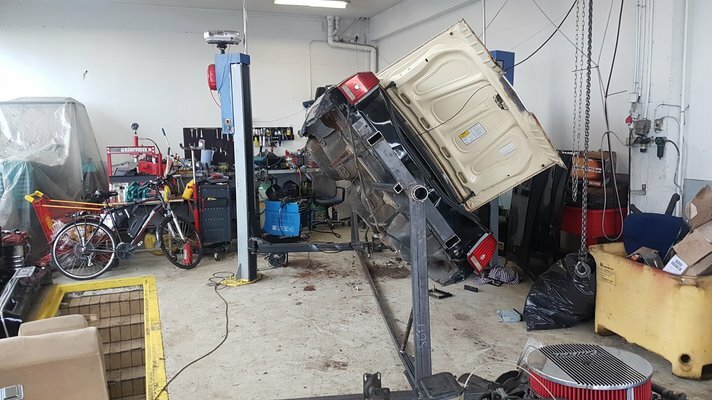 Hi, thanks for asking, it's not a conventional way of attaching a rotisserie to a car at all.. Usually you would use the body mounts to attach the rotisserie to, but then again, I had no such body mounts... they were all gone. 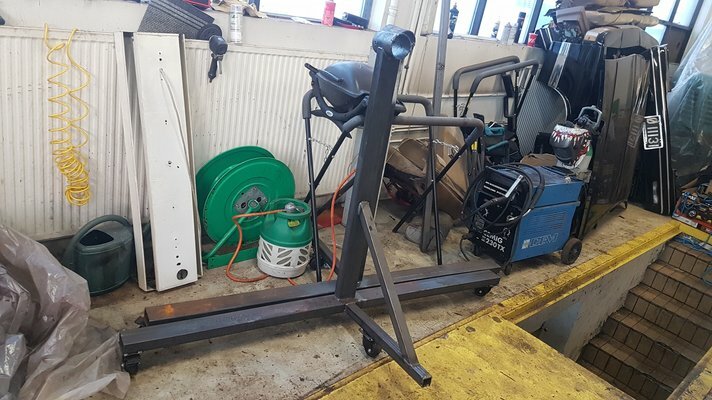 Or the other way, which I quickly decided to do, make a clamp around the trunk body and clamp the sheetmetal fastening it to the rotisserie at the correct weight-balance so the car can be rolled by hand, this was a difficult calculation and I got it surprisingly correct..! 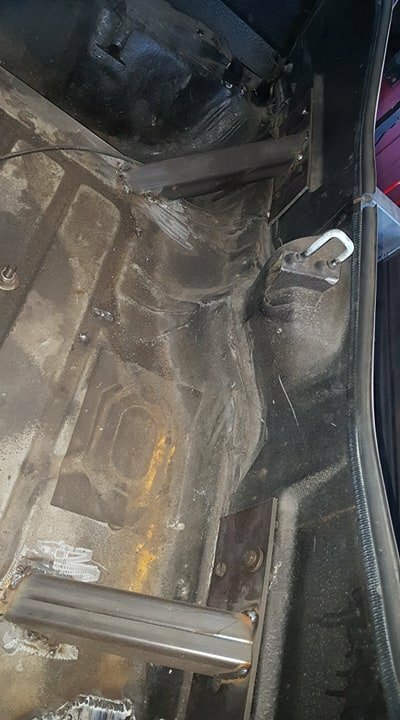 this would be the inside of the trunk, just to prevent the sheet metal of the trunk to rip apart and move on the joints, and I'm glad I did this because it all worked good, nothing moved or cracked not even paint peeled at the seams so it was done right given the circumstances. 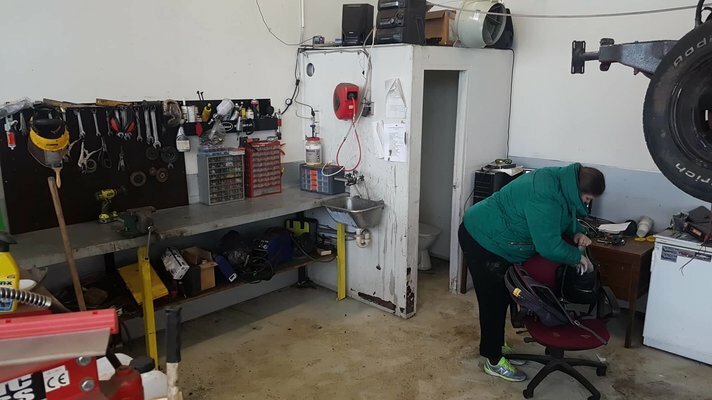 today mostly was cleanup day at the shop, this sparks motivation too, as I've been dreading the cleanup, but having the car in two piles now, instead of 7 piles makes me feel more motivated to spend time at the shop ! 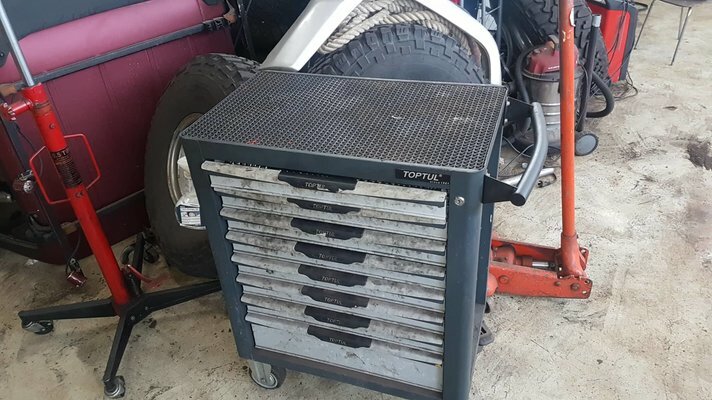 This toolbox has had >30 things on top of it since may last year... now it just needs a bath and it will look new ! The worktable, it's there after all..! I haven't seen it for a while..! 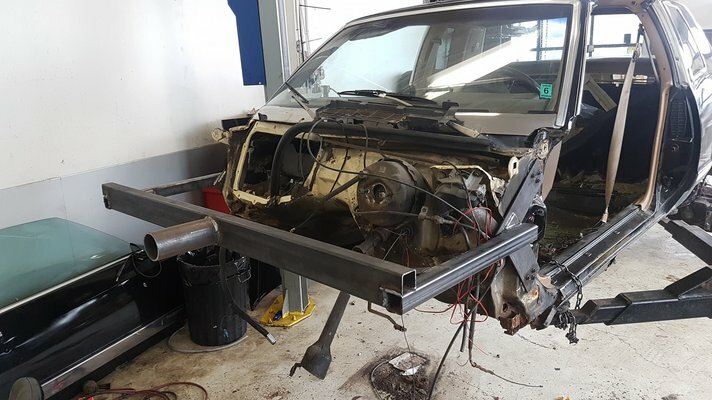 I had to make a few minor changes in the angle of the rear frame rail sections, they were hanging a little low so there was about two inches of gap between the body mount bushes and the nuts in the body, one inch was just swaying of the frame from being hung from the 2 post lift, but if I bolted it together with the other inch aswell there would have been binding in the body. 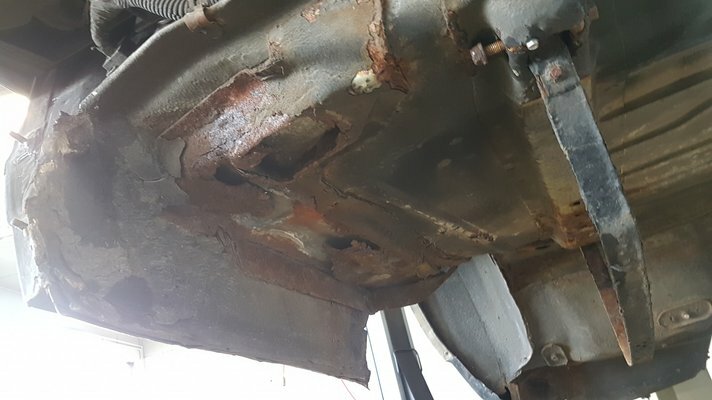 this is evident around the rear section where the bumper crash bumps go where there is very little clearance from the inner fenders, and also near the rocker panels where there is only a fingers' gap between it and the frame. Now I'm not safe yet, I still have to fit the doors to the car... if they fit good I'll be very happy, but I'm also prepared that some mending will be needed to get them fitting perfectly, so be it, it's only metal... play dough really. On that note, the doors are ruined! Simply buying the outer skin will not be enough, I'll have to buy the two doors along with the door frames new! But that will wait until summer, it's arpimd 1300 bucks with shipping, aftermarket. Wow your cruising through that project! Would it be cheaper to get a good set of original doors? They usually fit better than aftermarket anyway. yea if we find a set of doors that are spotless and willing to ship to florida ! Glad to see you are back at it, lookin' good. 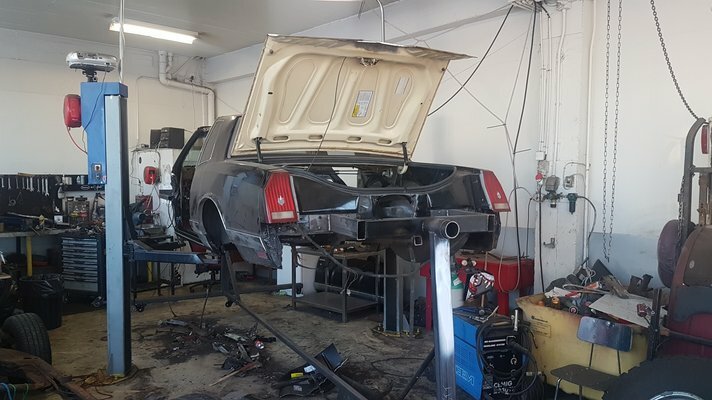 85 monte ss xdr/tt5 build update. 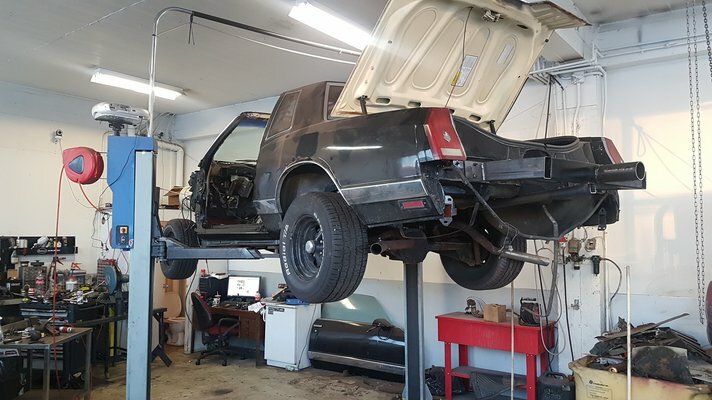 83 Monte gets a stronger heartbeat.